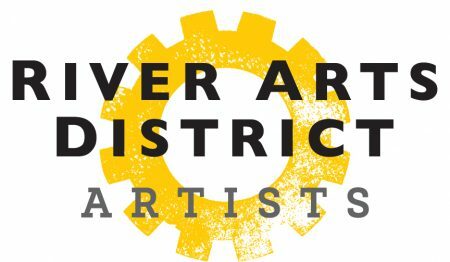 The Artists of Asheville’s River Arts District open their doors for a full weekend at the Fall Studio Stroll, welcoming the public to experience and collect amazing art in the studios and galleries. 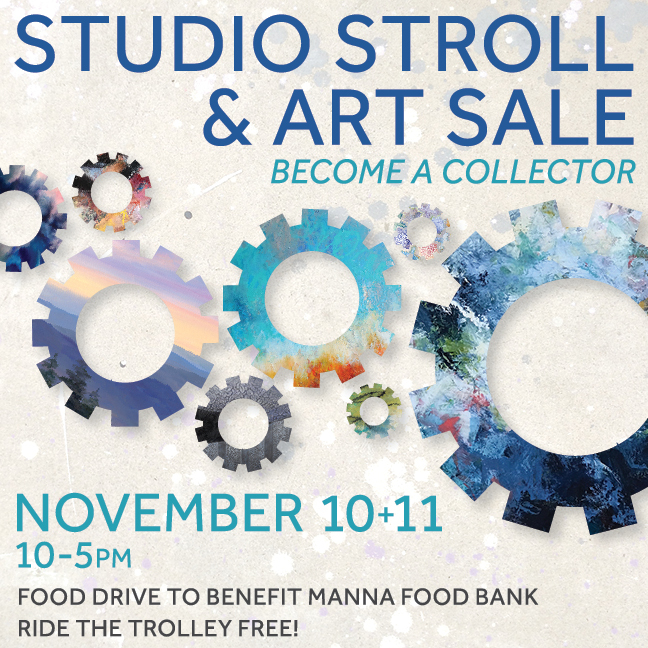 The Fall Stroll will once again feature a Food Drive in support of MANNA FoodBank by collecting non-perishable food items for our area’s needy families. Donations and information on the event will be located at the City of Asheville’s newly renovated building at 14 Riverside Drive. Attendees will enjoy free parking, restrooms and shuttle pick up at the location right on the French Broad River. The Artists are hoping to match or surpass the approximately 1000 pounds of non-perishables they collected last year for MANNA Food Bank. Musician’s Workshop & Asheville Guitar Bar Collaboration: Explore how we’re working together to better your Asheville Music Experience. Live music with The Mile High Band 4 pm – 7 pm – libations included! Live artists demos throughout the day – fiber arts, copper burning, painting! Wheel throwing demos and piercing porcelain vessels with Vivian Saich.Featured artists: Kate Gardner, Anne Jerman, and Joanne Carroll. Live music, snacks, and demos with RADA members exhibiting in the work areas of the studio. – Fold-form metal to make leaves with Viola Spells. Light refreshments served. – See a demonstration of titanium coloration! 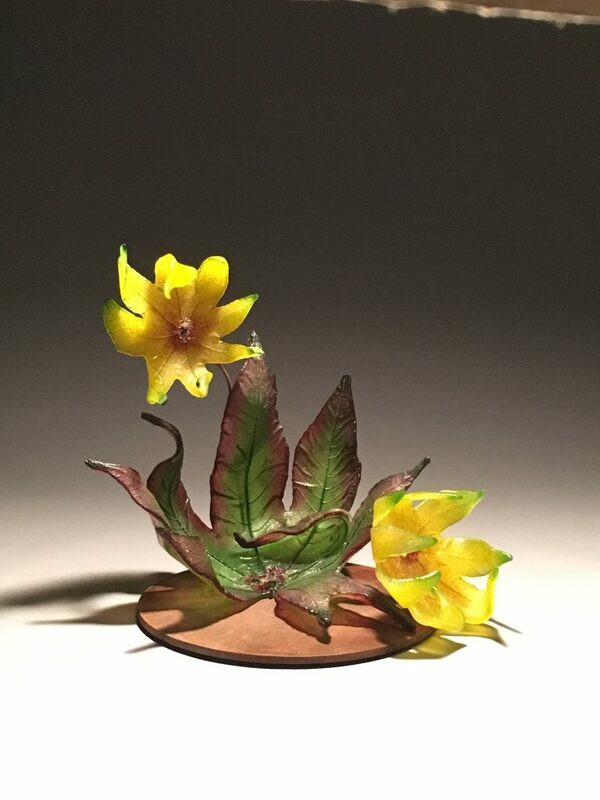 This magic metal turns beautiful colors when exposed to either heat or voltage. This latter process is called anodizing, and I will be showing how I do it once an hour at 15 past the hour from 11:15 until closing Saturday. Join Andrea Kulish for Ukrainian pysanky – Easter egg demos and light refreshments. An exhibit of West Henderson High School Senior Project, with mentor Deb Williams. Meet and greet the Senior Artist. – Historic Wedge Building Welcomes Fall. Variety of artist demos throughout the building. – Octopus Painting Demo! Discover Tessa Lang’s process as she creates one of her contemporary ink octopus paintings. Chair Artist Jenny Ellis will be creating a one of a kind “Ever After”Wedding Dress Chair! What else would you do with your wedding dress? Yes, she will be taking all the embellishments on the back and front of one dress to make a pair of beautiful chairs. Materials used for chairs: Silks, satins, beads, leathers, and cashmere, and hand applied embellishments! Don’t miss this incredible UPCYCLING at it’s finest! 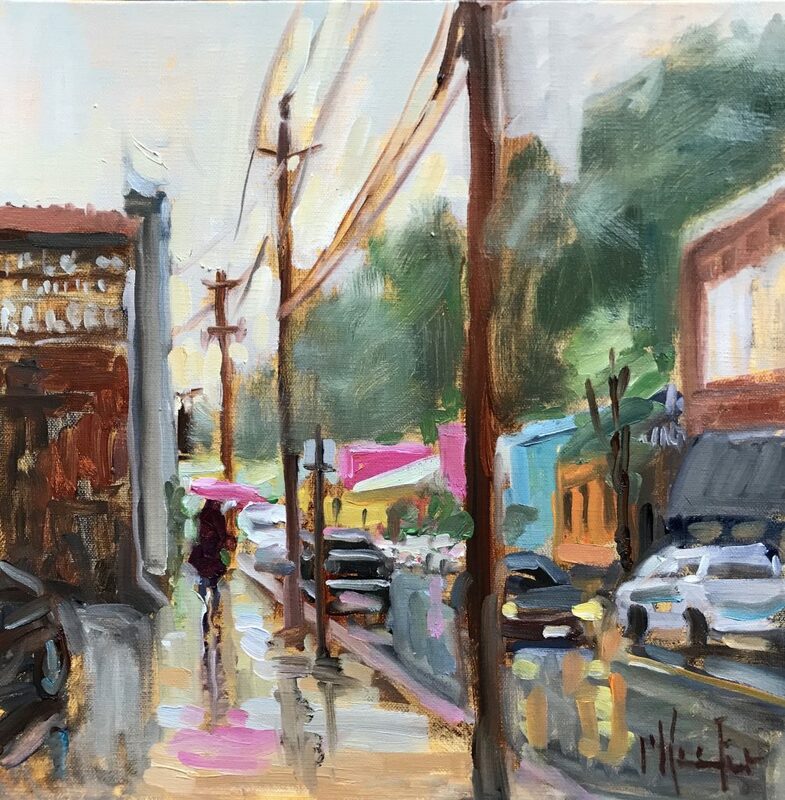 To celebrate having recently moved into his new gallery space (studio #111), Corey McNabb’s full line of elegant upcycled jewelry is 20% off (rejewelenate.com) and all of his original paintings are 25% off (mcnabbfineart.com) for both days of the Studio Stroll! Jones Studio at #211 will have small artworks at reasonable prices available for holiday decor and gifts. Cards, ornaments, ceramics, textiles, and prints. Please come to visit from 10 am – 5 pm Saturday. 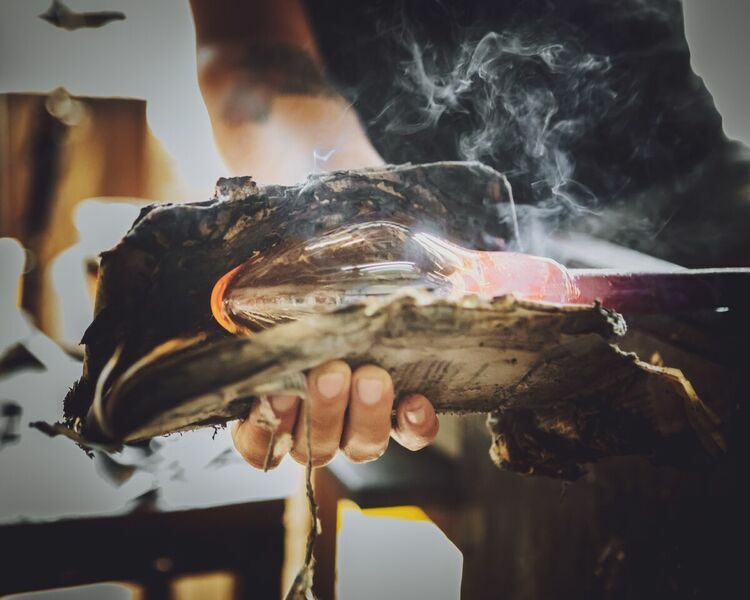 – The Horse: Passion and Fire is a special exhibit at The Village Potters, featuring new paintings by Jenny Buckner and new sculpture and horse hair pottery by Village Potter Judi Harwood. On Sunday, November 12, from 11:00am-2: 00 pm, there will also be Raku firing demonstrations by Judi Harwood in front of The Village Potters teaching center entrance. – Join us in Studio 256 to watch jewelry enameling right before your eyes! They will use both a kiln and a torch to fire silver jewelry with glass enamel for a bright pop of color. Drinks and light snacks provided, and you can browse the gallery filled with jewelry made right here in the studio from 1pm – 2pm Saturday.